What sizes do pony halters & bridles come in? 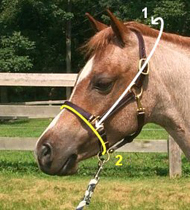 We have labeled all of our halters and bridles to fit the typical pony of the size mentioned in the chart to the left. These are guidelines only! You can't always tell what size halter or bridle will be right by the height alone. Sometimes an animal will have a smaller or bigger head for his size, plus different breeds have different shaped heads. For example, Welsh ponies usually have small muzzles and broad foreheads. Stallions will have much larger jowels as will Arabians or part Arabs. How do I measure for a pony halter? 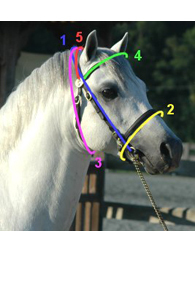 To measure for a halter, use a flexible measuring tape and take the following measurements. You can then email them to us and we can check the measurements against any of our products. We have labeled all of our halters to fit the typical pony of the sizes mentioned (see chart above). The distance from an inch or two below the point of the cheekbone on one side, over the crown, to the same point on the other side. The starting and end points are where the halter side rings will be. The distance around the nose (circumference) at the points mentioned above. 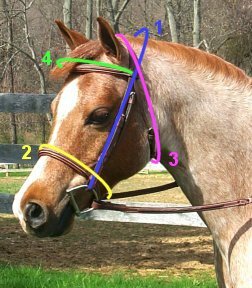 How do I measure for a pony bridle? 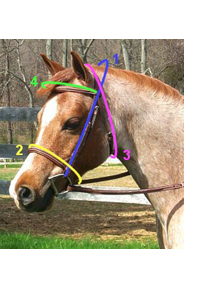 To measure for a bridle, use a flexible measuring tape and take the following measurements. You can then email them to us and we can check the measurements against any of our products. 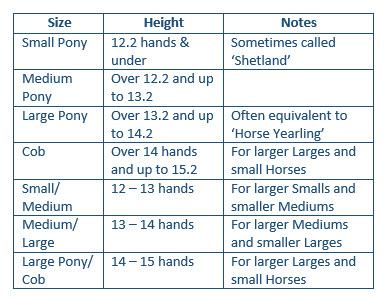 We have labeled all of our bridles to fit the typical pony of the size mentioned (see the chart above). 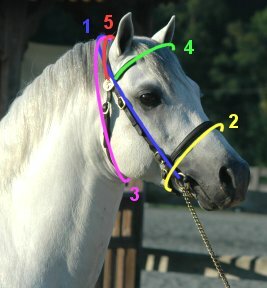 How do I measure for a pony in-hand bridle? Please send us the following measurements, following the diagram, to ensure a good fit. Also, if you're ordering a bridle that uses a bit, please indicate the type of bit you'll be using including the size of the ring.